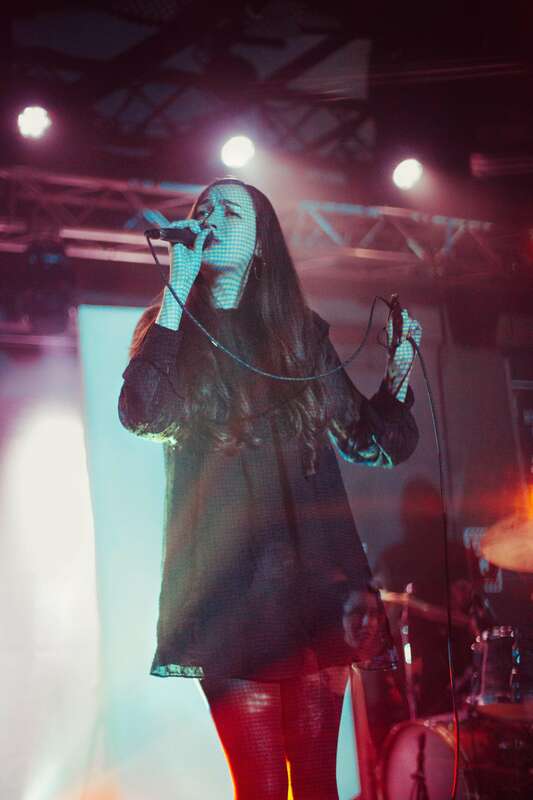 As my second of three concerts at Brighton Music Hall in one week, Cults did not deliver a standout performance for me. It was a drastic change of scene from the memorable show the night before by The Underachievers – the psychedelic rap duo from Flatbush, Brooklyn – not just because of the polar-opposite genre and demographic of fans, but also the energy level and performance quality just could not compete. The indie pop duo, Brian Oblivion and Madeline Follin, finally entered the stage at 10pm and had to fight for my attention. The band opened with ‘Offering,’ the title track of their latest album released in early October. In my opinion, the album as a whole is not exceptional (see album review), but this particular song stood out. In a bewitching black dress with Rapunzel-like hair, twirling and swaying about, Follin was quite charming. The set was aesthetically pleasing with a projection of the album cover, two hands extending towards the sky, on rectangular displays. Throughout the entire performance, the images changed with swirling, colorful patterns that matched the vibe of each song. However, I did not love how the projections came from the back of the venue and covered the band members’ faces the whole show. Although the Brighton Music Hall is an intimate venue, this made the performance feel unengaging and distant. As for the sound quality, it felt as though the buzzing synths and guitar were too loud and drowned out the vocals. This effect is an artistic choice common in their music, but it was much heavier live to the point where you could hardly make out the lyrics Follin was singing. ‘I Took Your Picture’ and ‘Right Words’ were also two of my favorites off of the new album, and this seemed to be in agreement amongst the head bobbing and grooving crowd who knew the words well enough to sing along. They closed out with ‘Go Outside,’ which fans were probably waiting for all night. The upbeat earworm is certainly their most popular song; it has been featured in commercials and played in stores for the last six years. Although they have the potential, I am not sure Cults will ever evolve past the status ‘Go Outside’ gave them in 2011.